Over the weekend I had a little time to read some new-to-me blogs. I don’t often have time to do that, so I was giddy with excitement as I started to click around and find new authors, some of whom have been around for a lot longer than me and who have a much—much!—bigger following than I have. Of course, that’s not hard to accomplish, I’m just sayin’. One of the blogs I kind of got hooked on and started to stalk follow was Don Miller’s blog. Now, I’m kind of hip (so NOT! ), and I’ve read Blue Like Jazz. I may have even liked it a little bit, but I can’t be sure because it was a long time ago and my memory isn’t what it used to be. But I’m thinking I liked the book because I sure like Don’s blog. If you haven’t ever read it, you can check it out here. One of the posts I read talked about his recent trip to Belmont University in Nashville where he helped the university kick off a campus-wide “experiment.” After he spoke, each student who wanted to take part in the experiment was handed a packet. Inside the packet was some money—a $5, $10, or $20 bill. But that’s just the beginning. The students have now been challenged to go do something for someone else with the money. They were encouraged to think big about how they would spend it on someone in need, maybe even coming up with creative ways to grow the money in order to do something bigger than they could ever imagine. Isn’t that energizing? Taking a mustard-seed amount of money and turning it into something amazing for God’s kingdom? Something about that just makes me tingle. The thought that one person with twenty bucks can actually make a difference. There’s a girl who goes to school with my older two girls who has made a difference by doing just that. Several years ago Kendall had a dream to help AIDS orphans in Africa after she watched an “Oprah” show about that tragic situation. She started by simply sponsoring a child through World Vision. But Kendall didn’t stop there. She has started a non-profit organization called "Kids Caring for Kids" and wants to raise $1 million for AIDS orphans in Africa. You can read her amazing story here. When I think about these stories, and the stories that will surely come out of the Belmont experiment, I see that it’s not the billionaires of this world who will make the biggest difference. It’s the little people like you and me who can take something so small and change a life. 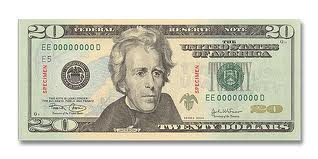 So tell me, what would you do for someone else if you were given $20? I think I would buy lunch and some other helpful things for the first homeless person I saw. Or I'd buy flowers for my co-worker who's going through a really hard time right now. Reminds me of a story my told me. When she and my Dad were young, they went to the mall on Christmas Eve with my oldest brother (who was only a year old). They didn't go to buy anything, just people watch I guess. Anyway, a woman came up to them and handed them an envelope and then disappeared into the crowd. Inside was a $20 bill in a Christmas card. It was so sweet of that woman, she saw that they were young newlyweds and had no shopping bags. Anyway, to wrap this up. I remember that woman every Christmas and pray that she is blessed. Her little act of kindness has traveled over the decades. It's amazing what the little things can do. Carrie, thanks for sharing that story. How cool that your parents were blessed in that way! Our church did that several years ago! Every single person was handed an envelope, each with varying amounts, and we were charged with intentionally spending it on somebody else. Then there was a time of the pastor reading stories of some outcomes of the exercise. Very cool!